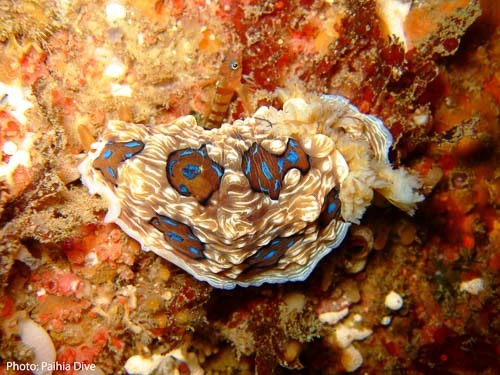 Bay of Islands marine life- what did it used to be like? 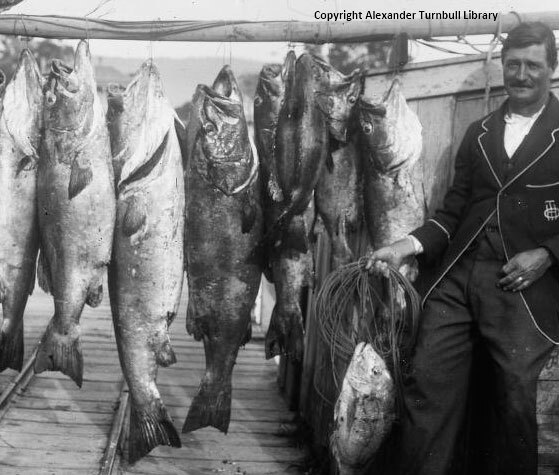 Oral histories, early writings and the first photos all tell us that the Bay of Islands used to be teeming with fish. And yet, we now often hear “the fishing is better than it’s been in years”. This mismatch is known as the shifting baseline syndrome, and is well documented in fisheries around the world. Basically, we don’t look back very far when we make our comparisons. Generally comparing today's fishing with what we remember from just 10 years ago. The result is a kind of generational amnesia. 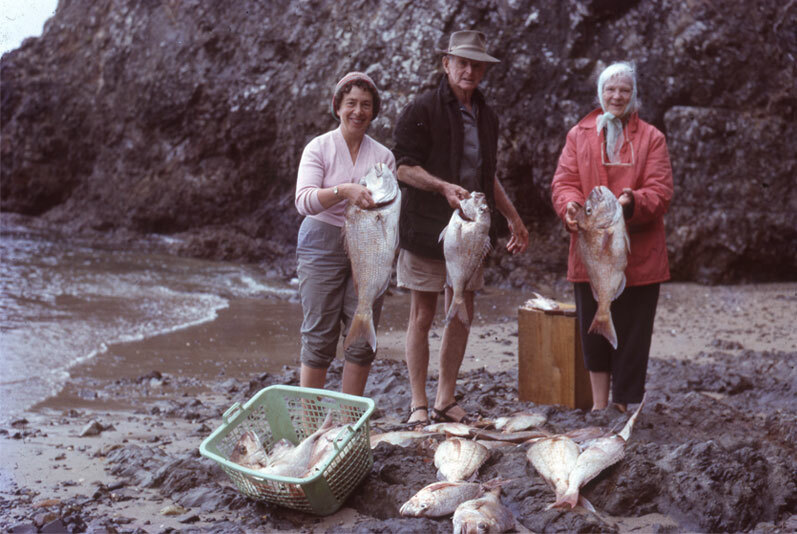 Our parents, grandparents, great-grandparents and their forebears would each have a very different idea of what a good days fishing meant! Here are some memories from the past to remind us that our current experience is of a hugely depleted ecosystem that urgently needs our help to restore some balance. 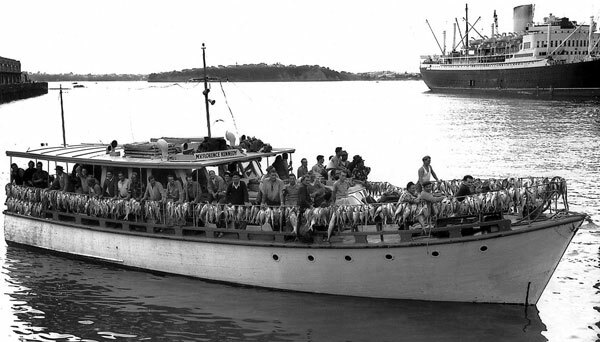 The Florence Kennedy II, a popular Auckland charter boat, returns to port in 1958 with over 3000 snapper caught by 48 anglers in a 4-h fishing trip in the Hauraki Gulf, New Zealand. Image reproduced from New Zealand Herald 1996, © with permission from APN Holdings. "We came into the Cape (Brett) about four o’Clock. There were fifteen boats around the great rock (Piercy) and five were fast to fish. Eight of the other boats had one or two Swordfish onboard. "We proceed to Bird Rock. Acres of Kahawai were darkening the surface and myriad little white gulls were hovering and fluttering over the top of them. The fish raised a white cauldron on the water and a sound exactly like a brook rushing over stones. The birds were screaming. Every now and then the kahawai leaped as one to escape some enemy underneath and made a prolonged roar in the water." 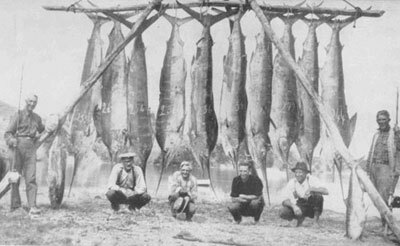 "The total number of sharks caught by the fleet, including those taken at the pakoki held a fortnight later, was about 7000 - an average of about 65 per canoe for each of the two trips"
"At the Cape, a half dozen or more boats caught nine marlin. One boat had five fish on; and twice it had a double header, which is two strikes simultaneously and in each case only one fish was landed." 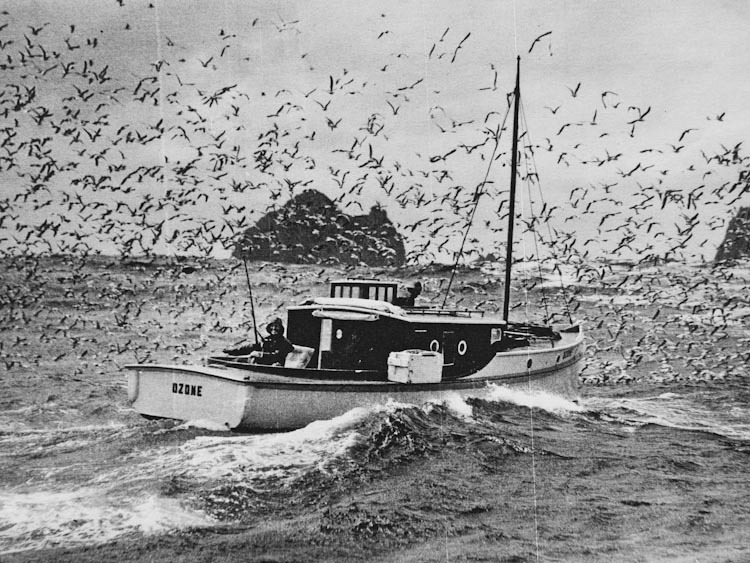 A fishing expedition by three anglers in a dinghy 500m off Paihia's Ti Beach in the 1950's. What would our catch be now in the same spot? What will it be like in 20 years time? 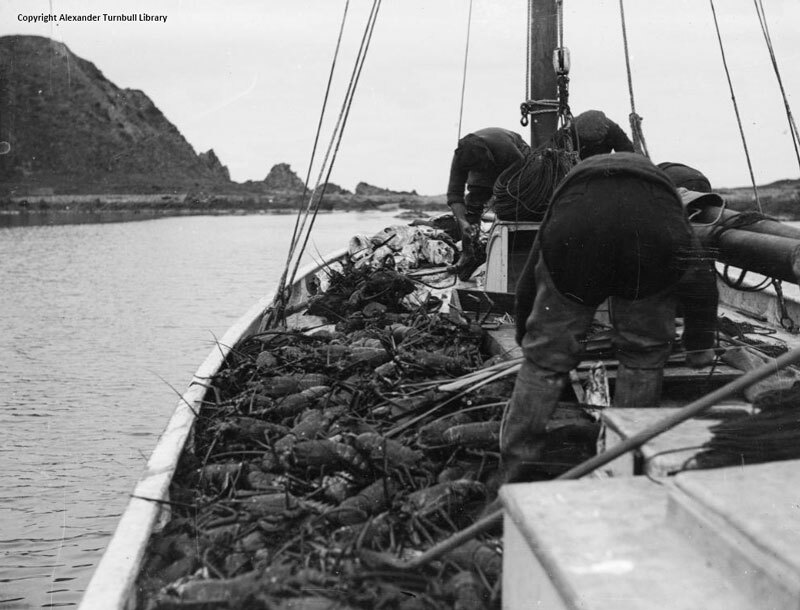 Before overfishing, crayfish were so abundant in tidal pools and inshore reefs a commercial boat load like this was easy to catch. The average size of snapper in pre-European middens was 50 cm long! 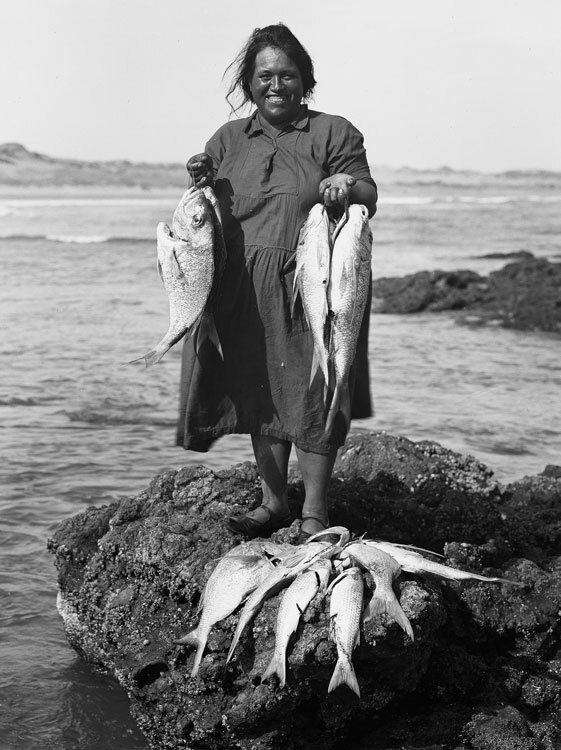 When did you last get a catch like this with a handline from the shore, like this wahine did in about 1910. Today we have to go to deep water to catch a Hapuku. However, they naturally inhabit water as shallow as 15 meters and were once easily caught close to shore.